Home FUBAR Should your online presence die when you do? Should your online presence die when you do? Should your emails, web albums and other online accounts die when you do? Or should you be able to pass them down to a family member much as you would a house or a box of letters? A leading group of lawyers says that families should immediately get access to everything online unless otherwise specified in a will. They are urging state lawmakers to enact their proposal so loved ones don’t get shut out as American lives move increasingly online. The Uniform Law Commission, whose members are appointed by state governments to help standardize state laws, on Wednesday endorsed the plan for “digital assets.” It would give loved ones access to — but not control of — the deceased’s digital accounts unless a will says otherwise. To become law, the legislation would have to be adopted by each state’s legislature. It would trump “terms of service” agreements by tech companies that prohibit people from accessing an account that isn’t theirs. “This is something most people don’t think of until they are faced with it. 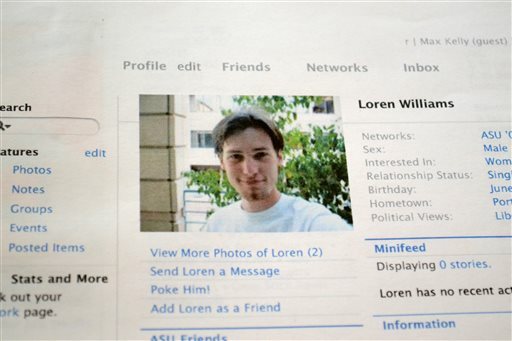 They have no idea what is about to be lost,” said Karen Williams of Beaverton, Oregon, who sued Facebook for access to her 22-year-old son Loren’s account after he died in a 2005 motorcycle accident. Facebook and other tech companies have been reluctant to hand over their customers’ private data, and many people say they wouldn’t want their families to have unfettered access to their life online. But when confronted with death, families say they need access to settle financial details or simply for sentimental reasons. What’s more, certain online accounts can be worth real money, such as a popular cooking blog or a gaming avatar that has acquired certain status online. Privacy activists are skeptical of the proposal. Ginger McCall, associate director of the Electronic Privacy Information Center in Washington, said a judge’s approval should be needed for access, to protect the privacy of both the owners of accounts and the people who communicate with them. Many people assume they can decide what happens by sharing certain passwords with a trusted family member, or even making those passwords part of their will. But in addition to potentially exposing passwords when a will becomes public record, anti-hacking laws and the terms of service agreements prohibit that. Several tech providers have come up with their own solutions. Facebook, for example, will “memorialize” accounts by allowing already confirmed friends to continue to view photos and old posts. Google, which runs Gmail, YouTube and Picasa Web Albums, offers its own version: If people don’t log on after a while, their accounts can be deleted or shared with a designated person. Yahoo users agree when signing up that their accounts expire when they do. But the courts aren’t convinced that a company supplying the technology should get to decide what happens to a person’s digital assets. In 2005, a Michigan probate judge ordered Yahoo to hand over the emails of a Marine killed in Iraq after his parents argued that their son would have wanted to share them. Likewise, a court eventually granted Williams, the Oregon mother, access to her son’s Facebook account, although she says the communications appeared to be redacted.